These duckies are just soo cute! They are for everyone, children and adults alike. They come in 2 sizes, 45 gms (left) and 20 gms (right). 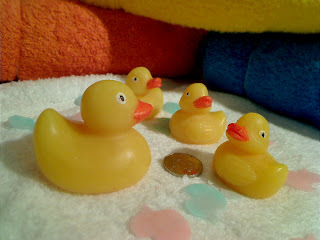 Included in the photo are blue and pink duck shaped soap confetti. Sprinkle the soap confetti on the surface of a bath, watch them dissolve and you'll have instant bubbles. Great fun for little ones.